FIRE CHOKE - The ability to superheat the surrounding air and pull out its moisture, eventually causing the air itself to begin to ignite and for the breath an opponent brings in to be searing hot and uncomfortable, causing internal burning and choking. War Stomp - A single stomp of the hoof can lightly rattle the ground and throw an opponent off balance. Acquired April 25th, 2013. Hatched May 9th, 2013. Suli is a vibrant green with black stripes that cover her body. Lining her back are dark spines that often flatten when in flight or when she grows defensive. 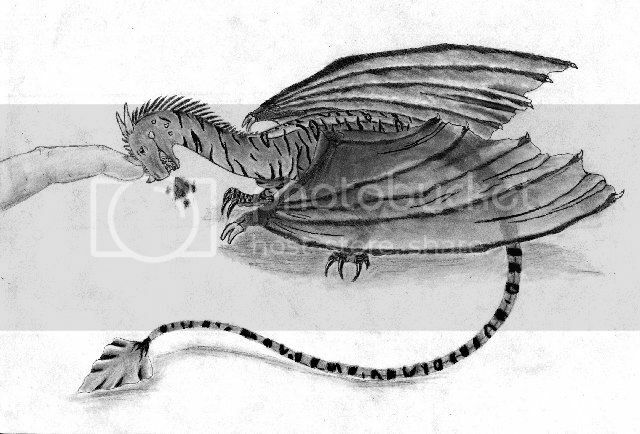 Unlike most dragons, she has only two legs, and often drops down to use her wings as legs, made easier by the use of two finger-like appendages at the end of each. Acquired February 3rd, 2015 in the World's Edge during Tallsun. Mane: Black, reaches to the point of his elbow. Body: Built like a classical Friesian. Hooves: Large, black, covered in feathering. Tail: Long, black, crimped and wavy. Scars: A jagged scar runs from the middle of his chest to the middle of his right shoulder, caused by the blade of a sword in Vallhea. Another scar left by an arrow mars his left gaskin, though it is much smaller and most visible in the summer when the hide is slicked. On his left shoulder lies an old burn scar from Smoke's dragon, Zaffre, gained while fighting for the title of Wingleader. ;; Born in a land called Gassul, and was part of the Zirga clan. ;; Began to train as a soldier at the ripe young age of nine months. ;; Partook in countless spars and several major battles. ;; The herds are scattered by a massive volcano, forcing him to leave at the age of three. ;; Wandered the land for a couple months by himself. ;; Is captured by a group of elves called the Vallheans. 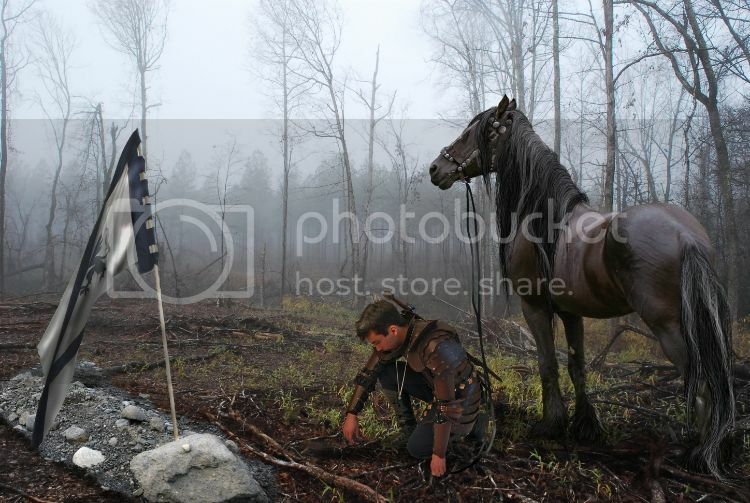 ;; After a lot of hard work on the humans' part, Destrier is trained as a war horse, and bonds deeply to his rider, Bran. 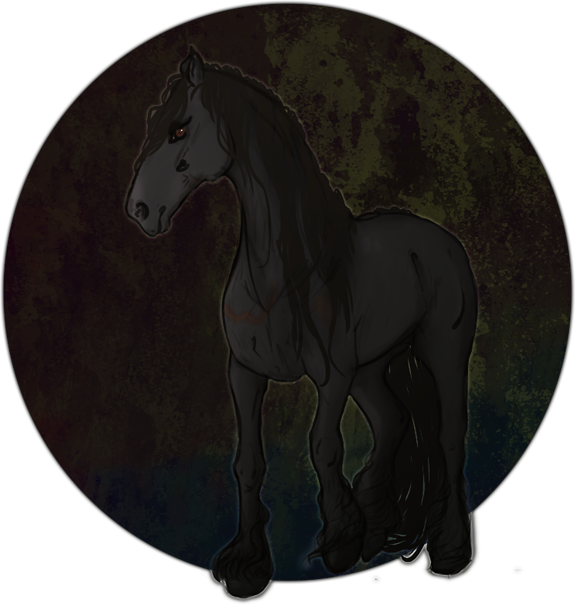 ;; Becomes a mount to the Vallhean army. ;; Lives and fights with Bran to protect Vallhea from invasions for many years. ;; Bran is killed during a war in which Vallhea is defeated. 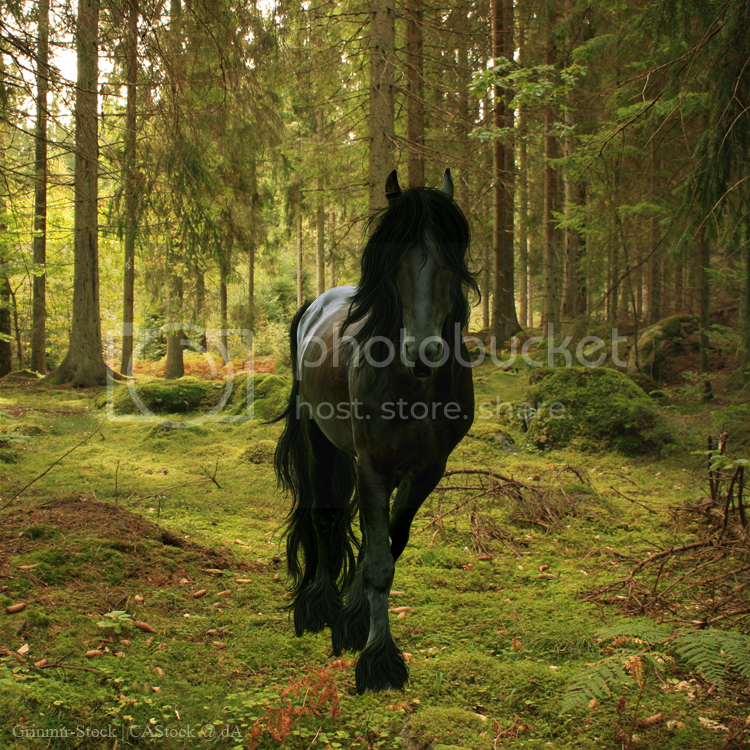 At this time, Destrier has been with him for seven years. 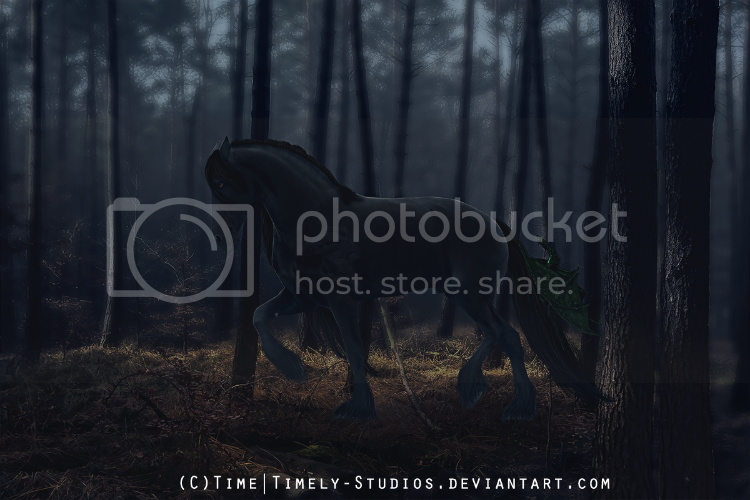 ;; Destrier is forced to flee to avoid being killed or taken by the enemy. ;; Heartbroken and lost, he wanders to Helovia. ;; Finds himself within the Threshold after fleeing Vallhea. ;; Is offered an invitation from Note to go to Dragon's Throat, but declines. ;; Goes to the borders of the World's Edge, Ink and Lace accept him. ;; Spars with Svetlana the Stormchaser, wins. ;; Attends herd meeting upon Mirage's return to the Edge. 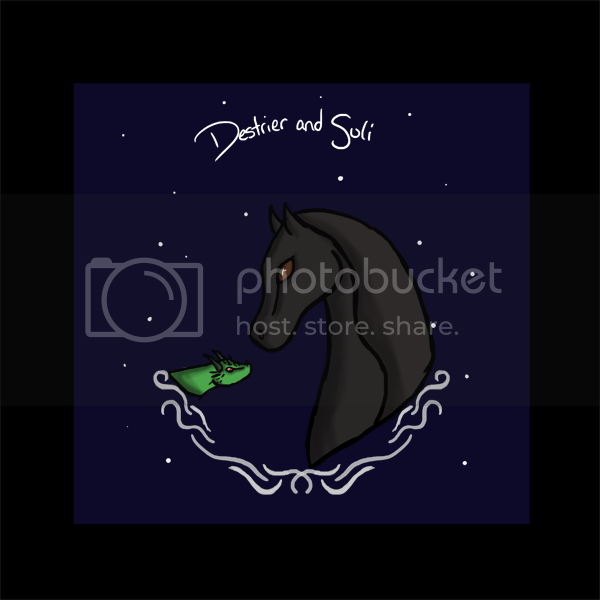 ;; Meets a troubled mare, Tor, in the Endless Blue. ;; Finds Tor in the Heavenly Fields, but they are attacked by strange birds. ;; Fathers the twins Laila and Luken, with Tor. ;; Is sent on a quest by the Sun God to receive dragonscale armor. ;; Speaks with Osiris to gain a black dragon scale. ;; Speaks with Peixos to gain a blue dragon scale. ;; Stumbles upon an equine rally, lead by Catillatio. ;; Partakes in a World's Edge tournament in attempt to gain Captain rank. ;; Defeats Smoke in the first round, progresses to round two. ;; Attends herd meeting, learns of Catillatio's plan, the Assassins, and the Plague. ;; Begins round two of the tournament with Paladin as his opponent. ;; Is named Wingleader, alongside Kaj. ;; Speaks with Mirage to earn a golden dragon scale. ;; Welcomes Vadim on the borders. Confronts Loki, whom is a trespasser to the Edge. ;; Follows Sakura into the Deep Forest, where they find faeries guarding a dragon egg. ;; Is sent by the faeries to rid the forest of large spiders. Convinces them to stay out of trouble in return for a safe winter home in the Edge, and is given the dragon egg. ;; Speaks with Luken and Laila of becoming warriors. 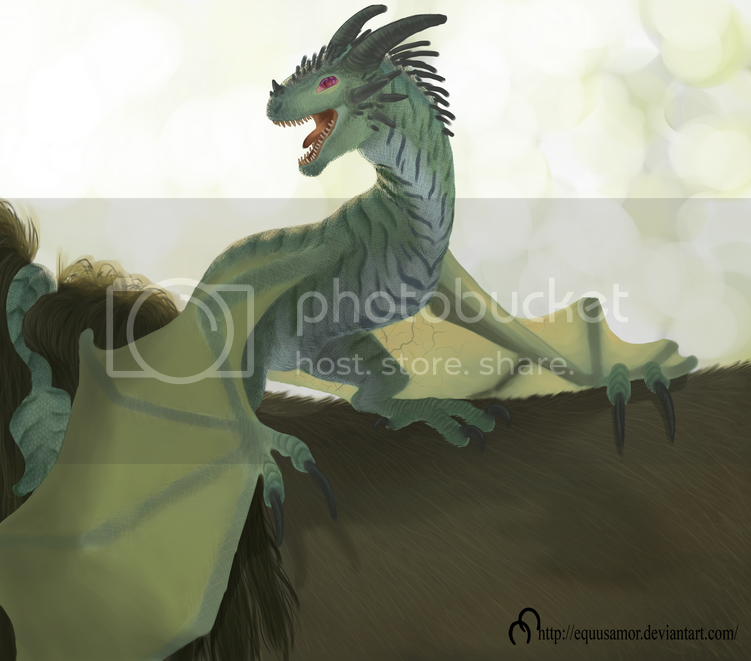 ;; Vikram alerts Destrier as to just what lies beneath the walls of the egg; a dragon! ;; Suli hatches; Sakura, Mirage, Semira, Amaris, Akaith, Vikram, and Luken are present. ;; Wanders to Helovia's Heart where he encounters Nyx and his daughter, Laila. ;; Attends World's Edge meeting to discuss helping others with quests. ;; Scours the Threshold where he encounters Ravahna and a member of the Assassins, Accalia. ;; Calls a meeting with Kaj to tell the Edge of the Protector/Acolyte idea. ;; Speaks with Lace after the Glazier's long absence. ;; Finds Kaj in the Edge, who has taken Tonka as prisoner. ;; Travels to the Heart where he faces a draconic enemy that has crawled from the Heart! ;; Finds Smoke in the Edge to learn about healing herbs! ;; Heads to the Marsh with Kaj, Luken, and Resplendence to dig up old dragon bones for his quest. ;; Is challenged by Sage for his title of Wingleader! ;; In the heat of his battle against Sage, the Aurora Basin unicorns begin to invade the World's Edge, bringing their challenge to a halt. Destrier faces Rafe, whom he defeats. ;; The World's Edge stands victorious against the Basin. ;; After some time healing, ventures to the Threshold where he brings Brisa home to the Edge. ;; Requests to have a plow made by the new Glazier, Kahlua, whom he then helps to build the glass wall around the Edge. ;; Travels with Aaron, Kahlua, and Quilyan to the Basin to offer a gift in the form of a glass scorpion. ;; Attends a herd meeting called by Mirage, and questions their standing in safety after the Basin's attack. ;; During a midnight patrol, he is called by Quilyan, who has disturbing news. ;; Calls a meeting with the Edge to discuss provisions while they analyze the potential threat from the marsh. 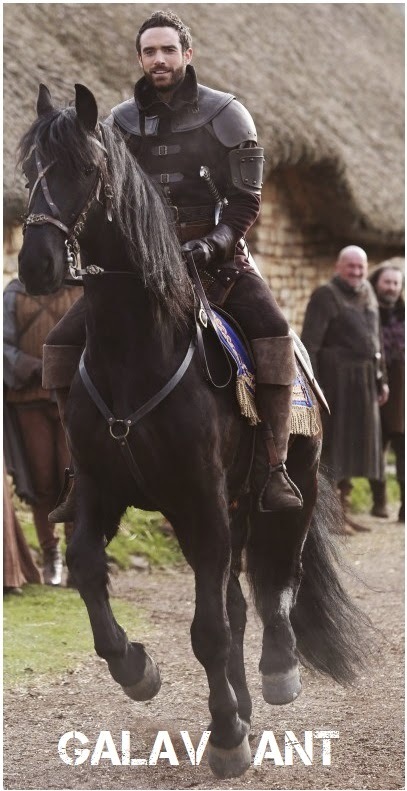 * Bran's looks are based off of Joshua Sasse from Galavant! Wears a full set of iron horseshoes. 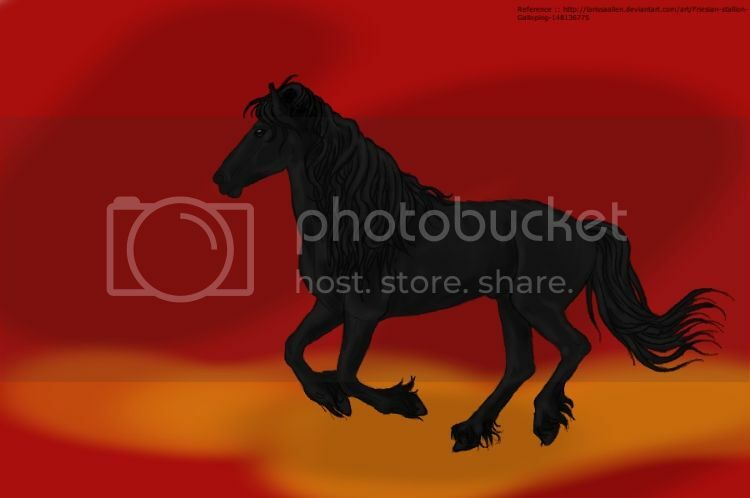 Wears a Algiz rune which is woven into his mane near his withers. 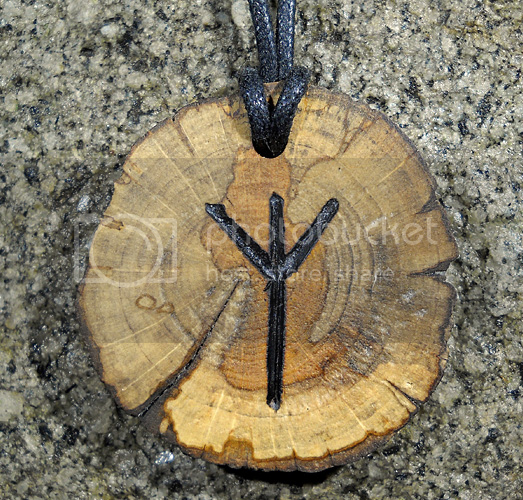 The Algiz rune is a symbol of protection, victory, new opportunities and challenges. 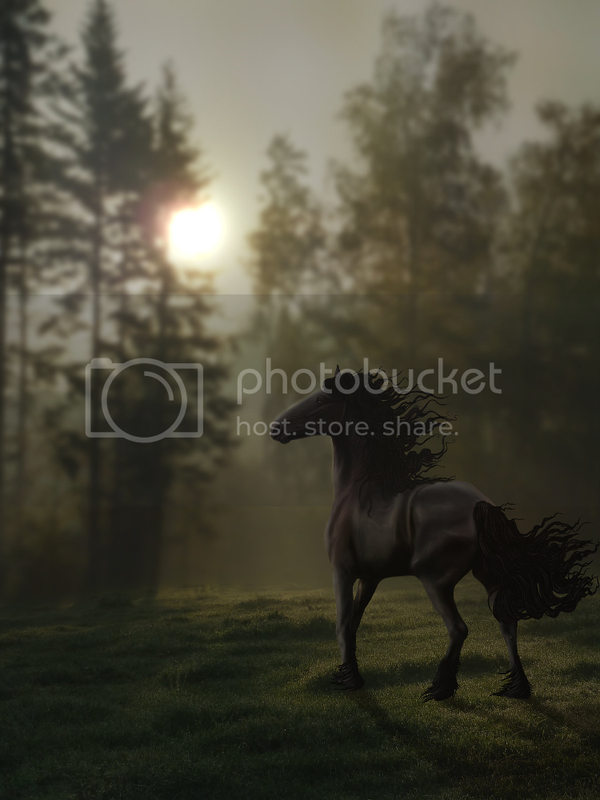 Wears a Ken rune which is woven into his mane near his withers. The Ken rune is a symbol of flame. The symbol it bears speaks of action, heroism, and is the rune of the fierce warrior. It is told that a Celtic warrior would wear this sacred rune around his neck in battle to invoke the Gods of war for assistance in battle. Sun God :: Storing Amulet :: When a magical ability is purposely cast at the amulet, it will absorb that magic and store it to be used at a later time. Dingo - Also plays Crowley and Finn. Email: Send Destrier an email.